Get the Best Quality Front Bars Available in Europe. Our 60mm Sahara Front City Bars add style to your Mitsubishi ASX 2012 with a purpose. The Mitsubishi Front Protection Bar is specially engineered to suit your ASX 2012 on 4x4 SUV and is designed to sit just below the Front bumper as shown in the picture below. This provides Impact Protection for those minor bumps and scrapes in the car parks! Our 4x4 Front City Bars and Side Bars are Hand Polished to a chrome look mirror finish. The quality of fitting is Excellent! We use only the Best European Quality Polished Stainless Steel Tube from Italian Steel Mills. Our Tube has a massive 1.5mm wall thickness for great quality Protection Bars. The price includes a Chunky tubular Sahara Front Bumper Guard Bar for all ASX 2012 on models which fixes to original mounting points and is supplied complete with all the brackets ready for installation. This product is totally NON DRILL and is supplied with all the fixing materials needed to fit the Mitsubishi Front Styling accessory to the vehicle. Stunning value accessory for your Mitsubishi ASX 2012 on SUV 4x4 giving an excellent finishing touch. *Note: Will NOT fit 2010-12 ASX Models, please check fog light detail in picture above. If in doubt feel free to call our Sales Team who will be more than happy to assist! great item and looks well as it says in the ad there's no drilling my ASX is a 2015 model but it doesn't say anything about all the cutting around the underneath plastic covers for the brackets to fit i was very weary about all the cutting. 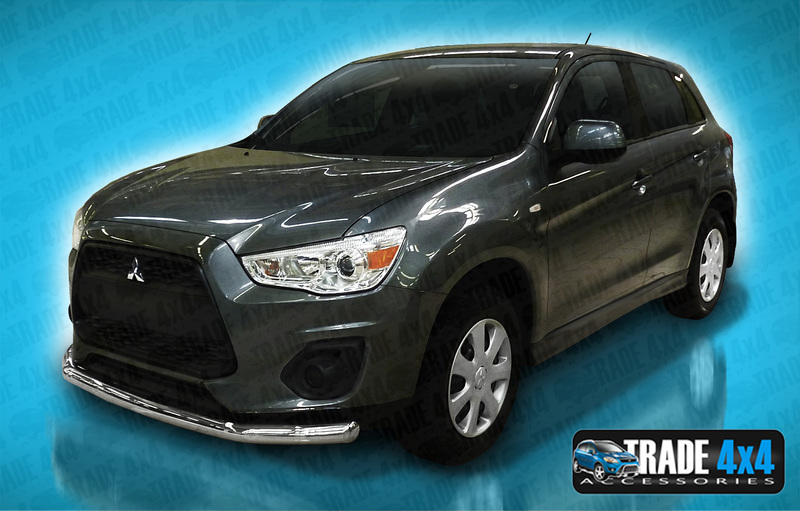 Click the button below to add the Mitsubishi ASX Front Bar 60mm City Bar Bumper Guard 2010-on to your wish list.